Alternative Kids Outfits for the Summer! Now that we've finally experienced the first full rays of Sunshine, every child's favourite time of year finally feels that little bit closer. Whether you've sorted your holiday plans or are just planning to take it easy this year, one thing virtually every parent should be preparing for is their child's summer wardrobe. Whilst last year's collections will no doubt serve you and your little one well once again, if you're after a brand new item of clothing that's just tailor made for sunlit fun, then we hope to make your search a breeze with these alternative kids outfits for the summer! Finding the right summer outfit for a girl can be particularly challenging, depending on what they enjoy running around and playing in (if that's even what they enjoy doing!). Whether they prefer dresses or something made for lots more movement, it's important that what they have to wear until September is light, comfortable and with a pattern to match the nice weather. Question Everything is a terrific choice in this regard, with a selection of alternative summer outfits for girls of all ages. For the youngest female in your family, the Crazy Bear Baby Romper is a 100% cotton suit with hand smocked detail and a popper fastening, whilst its cute grizzly pattern can also be found on the matching Crazy Bear Dress, available for ages 1-8 in various sizes. For girls who prefer an outfit that's easier to wear and allows for wilder antics, the Isabelle Playsuit is a tom-boy classic, with an elasticated waist and a pretty pink and blue ditsy pattern. What's also great about these outfits is that a percentage of every sale from Question Everything goes to Childhope Asia, Philippines; a care and education project for street children. If you and the family are lucky enough to be journeying to warmer climates this summer, then naturally what your little one can wear to the beach or swimming pool will require quite a bit of consideration. Swimming costumes and clothing available to buy at your holiday destination can be fairly expensive, plus they may be too uncomfortable after a long day out, and not even really be designed to keep your child safe from the Sun. Rockley Cove have some of the best children's bikinis and swimwear you're likely to find, with unique designs that put your child's comfort wearing preferences above all else. The Spotty Rashvest, for example, is a super quick-drying UPF 50+ sun blocking item of clothing that matches its spotty print with a high neckline that blocks against your girl's most vulnerable areas. The rashvest can be matched with any of Rockley Cove's matching bikinis, such as the Floral Halterneck, which uniquely hangs around the neck for comfort, speedy changing and great comfort. No alternative summer outfit would be complete however without a unique, sturdy pair of sandals to last well into next year, and beyond. A new addition to Birdkids, the range of Sun-San Sandals are widely considered to be one of the best choices in beachy footwear for both boys and girls. 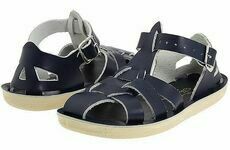 Made from the finest in American materials, the supple leather is 100% salt-water proof, whilst the rust-proof buckles along the ankle and toe straps make each choice of sandal fully adjustable. Perfect for paddling, exploring or just everyday use, if you're looking for a pair of sandals that will last, we definitely recommend going with Sun-San. What are some of your favourite finds in alternative outfits for the summer? You can share what your kids will be wearing when the weather gets good via the Birdkids Facebook page, at @bird_kids or via Google+.